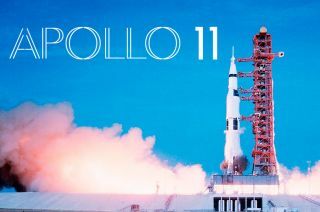 Todd Douglas Miller's new documentary "Apollo 11," presented by Neon and CNN Films, premiered on Thursday, Jan. 24, 2019 at the 2019 Sundance Film Festival in Park City, Utah. Stephen Slater, Matt Morton, Rick Armstrong, Robert Pearlman, Ben Feist, Todd Douglas Miller, Thomas Petersen, Eric Milano and Bryan Elmer attend the "Apollo 11" premiere during the 2019 Sundance Film Festival in Park City, Utah. A costume Apollo astronaut poses with the audience during the "Apollo 11" premiere at the 2019 Sundance Film Festival in Park City, Utah on Thursday, Jan. 24, 2019.